Matsutatsu Oyama is the Japanese name for Choi-Baedel, a Korean Karate master who founded Kyokushin Karate, and has been the subject of a few films, the last being the excellent Fighter in the Wind. Before that Sonny Chiba took a few stabs at the character, and made a film that looks as if it tried to be somewhat accurate, but then remembers that this is a Sonny Chiba film, and folks gotta die…badly. While I enjoyed the end fights, it just seemed contrary to everything that happened in the previous hour. 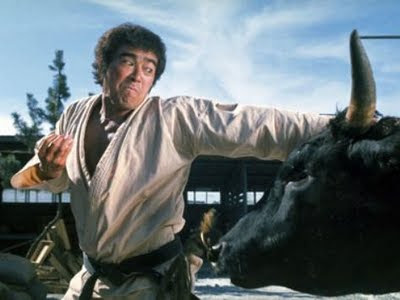 Sonny Chiba is…well, Sonny Chiba, but does a good job, and Mashashi Ishibashi once again plays Chiba’s whipping boy, whom Chiba’s killed in so many films I wonder if it’s in his contract. I found that Nakasone was a weak villain, but Ariake was a far more formidable opponent, but his story is cut short just as he was a more compelling problem for Oyama to deal with. The fight scenes were good, as Chiba’s usually are, but as I’ve said before in other reviews, if you aren’t used to Japanese Karate movies it may take some time to get used to, as their fights have a different cadence and choreographic style from Kung-Fu films. The final fight is the best, but once again abandons the earlier story of the film. 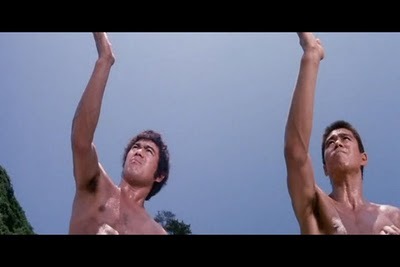 The best moment may involve the fact that as the fight goes on Oyama gets tired, which you rarely see in martial arts films. He’s beat, and has to catch his breathe as the fight goes on, and in one moment he hides in tall grass from the men chasing him, and one man falls on him, and the terrified look on his face was classic as he braced himself for the death strike he knew was coming, but died badly anyway. CHOREOGRAPHY: (6) The fight in the middle of the film and at the end are okay, and Chiba gets to show off his trademark karate skills, but it’s weaker in many respects to some of his other films. I looked forward to getting a showdown with Ariake that never came. STUNTWORK: (7) The stuntmen did a great job, and really sold their scenes, particularly when one of them gets killed by Chiba. These guys know how to make it look as painful as possible. FINAL GRADE: (6) Karate Bull Fighter is a decent film hurt by the fact that they chose the wrong storyline to follow. Ariake was the correct one. Ditching the drama to shoehorn in Sonny Chiba action ultimately hurts this film (and yes, I see the irony of saying that). NEXT: Stephen Chow and Norman Chui retell the legend of Beggar So in King Of Beggars! Next “Dragon Sukuro-ru: Reflections” is starting this week! in your post is just cool and i can assume you’re an expert on this subject. Fine with your permission let me to grab your feed to keep up to date with forthcoming post. Thanks a million and please keep up the enjoyable work. (1977) | Kiai-Kick! <Liked it! I want to recommend you few fascinating things or tips. her. See your buddies as if you were face to face with them during your web cam chat. DYHAB = Do you have a boyfriend DYHAG = Do you have a girlfriend. Our sprawling hotel, just off Nevsky Prospekt, dated back to the days of Communism. Besides increased hot weather effects, the results of warming lead to more extreme wet weather events. is to be there for your partner everyday. you wrote the ebook in it or something. I think that you simply can do with a few p.c. loved one. The mere presence off flowers can hve a secial effecxt on the human senses in evoking compassion. to cater the needs off every mourner, coffee will also be required by themselves. Can’t we just rent it from you? elborating on a number of thhe subjects you write about here.